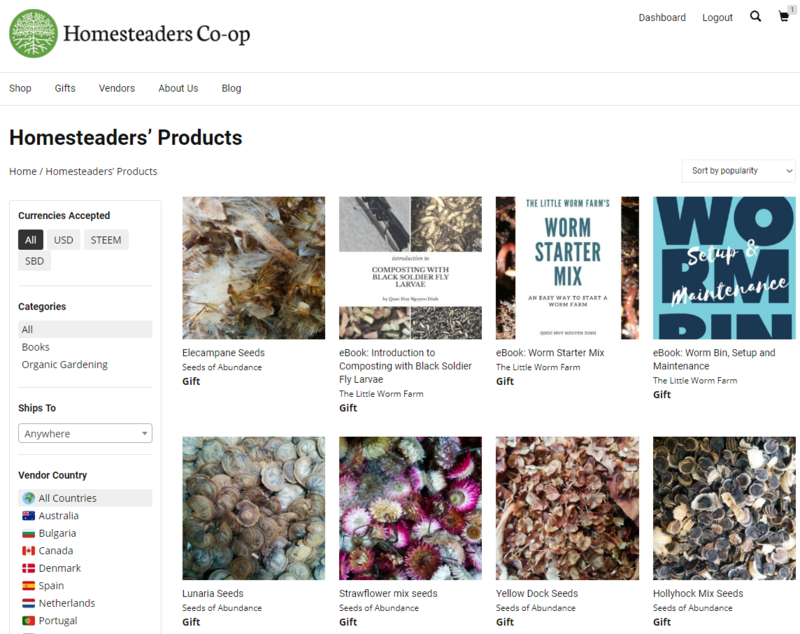 Last week I updated Homesteaders Co-op with the ability for our vendors to specify products as gifts in our marketplace. You can read about it here. Today I’ve made a new update to our website that has completely separated Shopping from Gifting. Our Shop section now includes all products that are denominated in some amount. The new Gifts section shows all of the gifts that are available at no cost (except shipping). I prefer to keep products for sale separate from the Gifts. I don’t want gifts to detract from the products that are for sale. And yet I want the gifts to have their own prominence. I prefer that gifts are making a statement. Because we are operating different than other marketplaces that prioritize profit over people. We are putting people in front of profit. A marketplace that wants to squeeze as much profit as possible out of their vendors and their customers would never encourage gifts unless they were sure it would mean more money for them. In our case, by looking past profit, our marketplace has the unique ability to explore more than one form of exchange. Suppose you ask me this: Why would someone provide a gift on this marketplace rather than asking to be paid for a product? I believe there is opportunity to feel rewarded in gifting to our fellow humans. The reward of giving can be very satisfying and has the potential to be equal or greater in value than the monetary value that is placed on a physical object. Perhaps our relationships can become deeper if we look past the physical level and deeper into our spiritual connections with each other. I give credit to @wwf for coming up with this observation. Because we are not seeking profit, and because we are seeking fair exchange of value (shoppers and vendors alike) – we are not dealing in commerce (whose rules are set by captains of industry). We are interchanging with each other as we seek to exchange our goods and services for an equivalent value; not value plus profit. My Seeds of Abundance store is already offering several varieties of seeds as gifts to our Steem friends that for one reason or another we decided not to sell but have enough amounts that we want to share. This weekend we just received our first order that included a gift request from @nateonsteemit. He ordered a packet of seeds from us and also requested some seeds we are gifting. I am really glad to see that he already used this feature and am excited to be able to share some surplus with him! @quochuy has generously shared his e-books for worm composting/farming and composting with black soldier flies as gifts in Homesteaders Co-op. Now that these new features are available I will be letting our vendors know that they can offer gifts if they so desire. What do the gifts mean to the Vendors? I won’t encourage any vendor to offer gifts in our co-op unless they have an interest in it. I completely understand the importance of earning money. It will be completely up to the vendor whether they operate completely financially, completely in the gift economy or any combination. They are also not obligated to fulfill a gift request. Thanks so much for reading. There is so much more planned and if you like what we are doing I encourage you to stay tuned. Lots of fun updates will be coming!